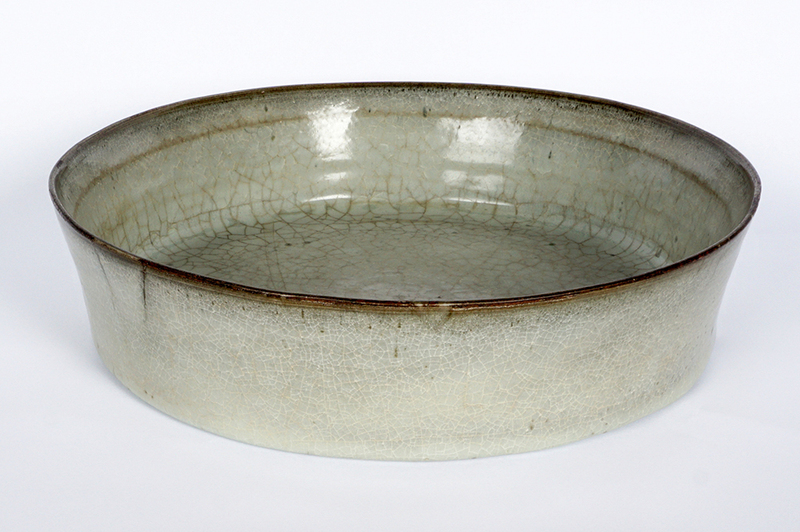 SARASOTA, FLA. — A 10-inch-diameter crackle glaze brush washer from the Song dynasty elicited an absolute bidding war as it sold for $1.35 million above a $6,000 estimate in Amero Auctions’ 286-lot March 31 sale. The Kuan ware work, circa 960–1279 CE, with a greyish glaze was consigned from a family unaware of its value. The dish featured 20 spur points and older dealer tags for Roland Moore, N.Y., and Blitz, Amsterdam. It was accompanied by an old typed letter stating that piece was purchased in 1940 at an exhibition of Chinese Arts in New York. Alan Amero, owner of the auction house, said the West Coast-based family had previously consigned a Chinese Ming blue and white decorated jar that brought $35,400 in the firm’s February sale. The result inspired the goodwill to send the brush washer to auction. After a prolonged bidding war between the phones and the internet, the lot was purchased by an Asian bidder who resides in Italy. Some auctioneers can wait decades before making a million-dollar hit, but Amero remarkably found his in only the firm’s sixth catalog auction to date, its premier sale debuting less than a year ago in May 2018. Other highlights in this sale were a Seventeenth Century Flemish tapestry that sold for $34,200 and a 1968 George Chann painting that brought $15,300. With results like these, Chinese buyers are seemingly watching the firm’s sales closely. Adding to the “sleeper” results above, the firm posted a $94,000 result for a Chinese Ming dynasty blue and white planter on stand in its December 2018 auction. For more information, www.ameroauctions.com or 941-330-1577.